Everything you can do at the post office except wait in line! Establish an account, then load with funds. Print stamps, mailing and shipping labels. Requires only a PC, inkjet or laser printer and an internet connection. Access to all USPS services like parcel post, international and certified. The "Quick & Easy" Post Office™. Everything you can do at the post office except wait in line! Now open on a desktop near you. Establish an account, then load with funds. Print stamps, mailing and shipping labels. Requires only a PC, inkjet or laser printer and an internet connection. Access to all USPS services like parcel post, international and certified. FedEx also available. 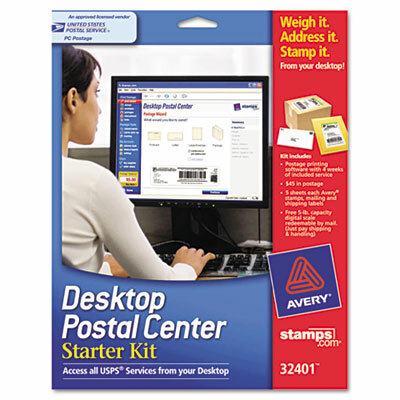 Includes 30 days of postage service, $40 in postage, 5-lb USB scale (by mail, user pays shipping and handling), five sheets of printable stamps, five sheets of shipping labels and five sheets of 3-part mailing labels.